Asheville, NC, May 10th, 2019- Joyryder Cycling Studio in Biltmore Village is pleased to announce the opening of Last Summer, a solo exhibition by Zander Stefani. The opening reception is Friday, May 10th from 5 - 8 pm. Last Summer is a pop up exhibition, and will only be open the night of. Joyryder is located at 14 Lodge St, Asheville, NC. The event is free and open to the public. The first twenty people to arrive receive a free signed and editioned poster. Zander Stefani received his B.F.A. in painting from Savannah College of Art and Design in 2017. Upon graduation, he moved to Asheville where he is continuing to nourish and transform his body of work. He has exhibited his work across the eastern United States. Zander is an instructor here at Joyryder, and has been with us for almost half a year. He has brought a great energy to the team and we look forward to exhibiting his art. For this body of work, Stefani is referring to a particular period in his life, but moreso a feeling: the immense wave of nostalgia that hits when we remember our most beautiful moments. There will be a series of new paintings, as well as a video installation. We are also collaborating on a limited edition t-shirt that will be for sale the night of the show. That which you are seeking exists within your reach.. Right now, in this moment. There is no separation. There is no then and now. There is only now. The only thing holding you back is the limiting beliefs you hold close to your heart… the unconscious stories you keep telling yourself. The idea that the past must repeat itself. Yet, that is not true; every moment we are reborn. Every breath is a new opportunity. You have to stop searching in order to find what you are looking for. Accept the infinite glory of your life as it is; embrace the here and now as it is. No matter what you experience in your reality, the only experience that matters is within. Only once you find solace in your heart and in your mind, will the world begin to reflect that. There's something been going on, while you were busy taking notes. There's something good happening, it's good to sometimes slow it down. What's the point in pouring it all out when you guys just wear it on your coat? I believe that for this piece of time we can really crank us up a lot. You just gotta do it, that thing you’ve always enjoyed doing. don’t worry about how it’s gonna work out in the end. Chase after your dreams, even if they seem impossible. Existence is nothing more than a game we play. It is happening every moment. You are here in every moment. Your presence is required at every step, every decision. Every question leads to an answer which leads us down a path that takes us to where we are. It is up to each of us to make steps to create a life we want to live. Make a choice that scares you, and takes you one step closer to fulfilling your dreams. This mural would not have happened without the help of Blu29, and the making of video wouldn't have happened without the help of my friend Daniel. Much love to both of them. I am very much looking forward to my next mural, contact me if you are interested in having me on your wall! Opening night was a great success! Thank you to everyone who came out to support the arts. "I AM, ARE U?" will be open until May 25th at The Refinery in Asheville, NC. Thanks for the feature Mountain Xpress! The AAAC is excited to announce Zander Stefani’s upcoming exhibition: “I Am, Are U?” in the Front Gallery of the Refinery Creator Space. An exhibition that ponders the phrase: ‘I am’, Stefani exemplifies the constant moral battle between self and other. The way all past experiences blend to become a reflection of the present moment. Life is a monumental journey and we are mere human beings facing the infinite universe. He explores the questions of identity that we are all forced to face each day, contemplating the boundaries society embeds on us from the moment we are born. While this new body of work has a more developed sense of style, Stefani’s figures continue to portray the same sense of entrapment; plagued by the illusions presented in this world, yet realizing the infinite depths of reality. Intertwining tones of spirituality and street style fill the visual plane in Stefani’s work, bringing to light the palpable connection between the pure expression of graffiti and the intense meditation of spirituality. He tends to work autonomously, allowing the painting to reveal itself through many transparent layers of acrylic paint. Zander Stefani (b. 1994, Toronto) is a graduate of Savannah College of Art and Design, in Savannah, GA with a BFA in painting. He currently lives in Asheville and has exhibited along the eastern United States. His work can be seen in the homes of collectors throughout North America. “Our world these days is so reliant on labels and beliefs in order to be properly delineated and judged. It is hard to have a conversation with a young adult that doesn’t end up revolving around social media, orientation, goals for the future, the steps you will take to get there, etc. We place so much importance on how we identify ourselves that our true spirit gets lost in the mix. The exhibition will be open to the public in the Front Gallery from Friday, April 6 – Friday, May 25, 2018. With an opening reception on Friday, April 6th from 5-8 pm. The first 50 attendees to arrive will receive a free signed and editioned poster! Non-Fiction Gallery, a program of Art Rise Savannah, is pleased to announce the opening of Greetings from Wonderland, a two-person exhibition by H. E. Ramage and Zander Stefani. The opening reception is Friday, May 19th from 6 – 9 pm. Non-Fiction Gallery is located at 1522 Bull St, Savannah, GA, and the event is free and open to the public. Using a variety of mediums, both artists present the concepts of spirituality and purgatory in their work. H. E. Ramage and Zander Stefani use painting, sculpture, and installation to manifest visions of intense existential moments. The work of the two artists is united by their passion to find comfort in the uncomfortable. The Alexander Collective’s first annual Salon show at Non-Fiction Gallery is happening this Friday April 7th from 6-9pm! As part of Savannah’s official First Friday Art March your eyes will be mesmerized with well over 100 entries from AC members, ranging in medium, subject matter, and size. I have two pieces in the show, it was great to be a part of! Osagie Ehigie, dance education and arts management teacher at Black Water Middle School, wanted a more vibrant and colorful hallway to inspire his students. 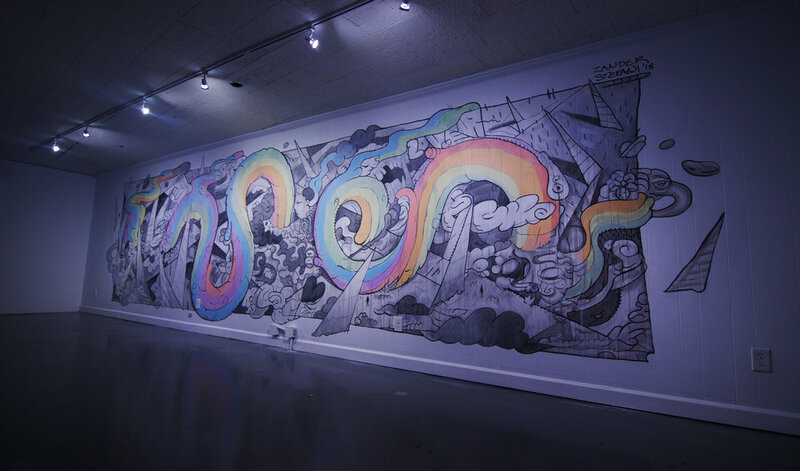 He originally planned to commission just one mural from an artist who could capture the “chaotic energy” of his classroom, and after weeks of research came across Zander Stefani’s website. Stefani is a Savannah, Ga.-based artist who attends the Savannah College of Art and Design. 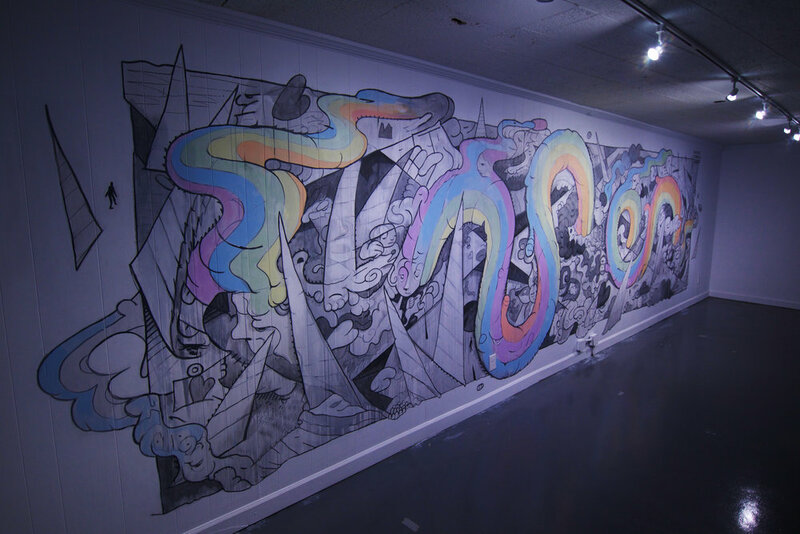 After doing his research and budgeting for a small mural, Ehigie reached out to the 20-year-old artist who agreed to paint a hallway near the dance room. Ehigie set a few guidelines for the paintings and asked Stefani to create something vibrant and reminiscent of the energy found in middle school dance rooms. Stefani jumped head first into the challenge. That mural helps illustrate how students are so accepted here. We celebrate diversity, and students can be anyone they want to be. Stefani used a mix of spray and acrylic paint to cover over 140 feet of wall in vibrant yellows, greens, blues and oranges. Much of the work is reflective of colors found in nature and in the flow and movement found in dance. “I wanted the capture the energy that comes with dance, and I wanted to give it an energy that would invoke excitement,” Stefani said. Black Water is the only middle school in the district with a dance education program. Ehigie teaches about 150 children throughout the year and includes lessons in tap, ballet, hip-hop and jazz. Thursday night (11/17/16) 3rd Thursday, is the opening of the show “Re Group”. Redefine Gallery put out a call to artists and received over 100 submissions from all over the country and overseas. They selected 24 artists whose work was inspiring, and I was lucky to be one of them! Doors open 6pm-10pm and is free/ all ages. SCAD presents “Small Works,” an annual juried exhibition of work by SCAD students, alumni, professors and staff. All works are for sale and measure 18 inches or less in all dimensions. The majority of the art can be purchased for less than $300 per piece, and the exhibition includes photography, paintings, prints, jewelry, fibers, sculptures, artist books, ceramics and illustrations. Reception: Thursday, Nov. 19, 6-7:30 p.m.
For more information, please contact Chris Constas at 912.525.4743 or cconstas@scad.edu.